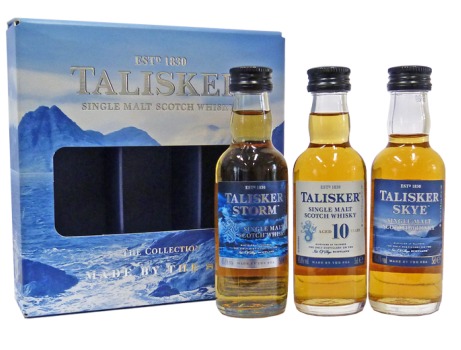 Introducing a stunning tasting gift pack including Single Malts from the amazing Talisker distillery, located on the Isle of Skye. The classic stalwart of the Talisker family, the warm and subtle smokiness of Talisker 10 Year Old should be sampled neat. Has all the warm, smoky, peppery characteristics loved in the standard Talisker 10 Year Old but they've been turned up a notch. An easy-drinking Talisker, taking the distillery's classically rugged character and softening it out, while maintaining the smoky and sweet notes the distillery is known for. Nose: Sweet with toffees and vanilla, almost grain-like. There is a coastal influence to this Talisker with hints of a sweet Caol Ila with a restrained smoke. Palate: Honeyed toasted oak with a warming hint from pepper as smoke lingers. Fruit then appears with hints of citrus and finally fennel seeds. Finish:: Drying with the sweetness calming down, hints of spice and smoke.